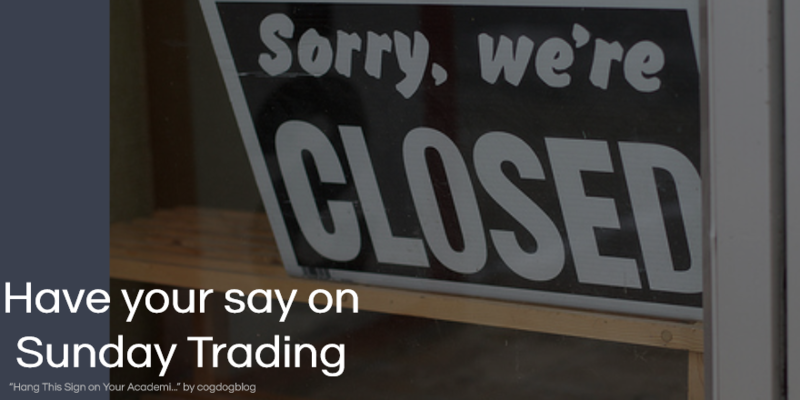 We asked for your views on whether the government should devolve Sunday trading rules to local areas, such as cities run by elected mayors and/or local authorities. We received over 7,000 responses to our consultation. The majority of respondents to the consultation from local authorities, business representative organisations and large and medium business respondents were in favour of our proposal to devolve the power to make decisions on extending Sunday trading hours to a local level. However, Trade Unions, religious bodies and a number of small businesses and individuals who responded were against the proposals. We will also strengthen the rights of shop workers to ’opt-out‘ of working Sundays, if they choose. These rights will apply in England, Wales and Scotland, whereas the Sunday trading rules apply in England and Wales only. We will bring forward these measures through amendments to the Enterprise Bill. Government has no plans to take forward reform of Sunday trading at this stage. Large shops (those with a relevant floor area of over 280 square metres / 3,000 square feet) have restricted opening hours on a Sunday, but smaller shops can open all day. This consultation seeks views on whether the Government should devolve Sunday trading rules as part of its localism agenda in order to give local areas greater control of their local economy and improve the well-being of local citizens. Devolving powers to Local Authorities more generally across England and Wales. The current Sunday trading rules were established 21 years ago in the Sunday Trading Act 1994 (‘1994 Act’). It limits the Sunday trading hours of shops with a relevant floor space in excess of 280 square metres in England and Wales to six continuous hours between 10am and 6pm on a Sunday and not at all on Easter Sunday. Smaller shops have no restrictions on Sunday opening. Exemptions apply to certain shops such as off-licences, pharmacies and motorway service stations. There are no equivalent restrictions in Scotland, but there are similar restrictions in Northern Ireland. Since the 1994 Act was passed the consumer environment has changed significantly. Despite this increase, Sunday trading restrictions continue to limit shopping on the high street, whereas consumers can buy from online retailers at any time. Devolving Sunday trading rules would give greater choice to consumers as to when and where they shop, irrespective of the size of the store. It would also give businesses a greater choice as to when to open their stores. It would also give those shop workers who wish to work on a Sunday greater choice, whilst protecting those workers who do not. This may encourage increased footfall in high streets on Sundays to the benefit of all local businesses, large and small, and to those dependent on public transport. And it could offer particular advantages to working families who may be most able to do their shopping at the weekends. On the other hand, Sundays are special to some people for religious reasons, and the Government is sensitive to the religious significance of Sunday and values the role that religion and religious communities play in our national life. In launching this consultation the Government is seeking views on devolving Sunday trading rules to local areas and we welcome comments from as many interested parties as possible.